Of course, any spoon could become a "love" spoon if that were the intent of the giver. 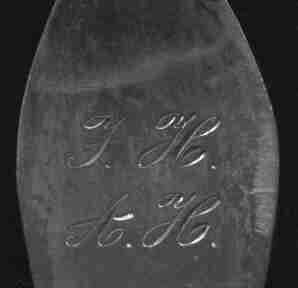 It is very common to find spoons engraved to a particular person, and we sometimes find spoons engraved with love messages or unusual wording. 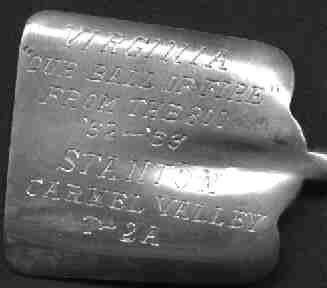 This very unusual shovel spoon (marked Sterling Souvenir) has an interesting message engraved on the back. I have not been able to figure out this message, if you have any idea let me know. "Virginia, "our ball of fire" from the 800 '52-'53 Stanton Carmel Valley T-2A"
I thought "our ball of fire" was related to the Woody Guthrie song "Great Balls of Fire" but that didn't come out until 1957. I suspect the "800" possibly refers to a class because classes are often referred to in this manner. Stanton is a city in Carmel Valley, California. Have no idea what the T-2A means. Any one with other ideas is invited to write me. I have had this spoon for a very long time. When I first purchased it, I thought that it was an older spoon because of the shape of the bowl and the engraving style. After analyzing the marks, I have determined that it is from Denmark and was made about 1910, but it is done in a style which is about 100 years earlier. 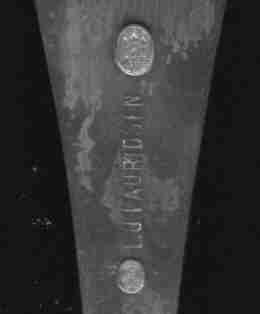 I can only surmise about the meaning and thought that went into this very pretty spoon, but upon reflection I have determined that it is probably a gift made by the groom to his bride. If you have a different interpretation of this spoon, email me.